It's storming in the Ozarks yet again but I did want to grab a quick couple of minutes and show you this week's card before I drop it in the mail. I've nearly depleted my magazine stash. I find myself going back to the same ones over and over. That's a good thing, right? One area I haven't touched are the Take Ten magazines from Stampington. I love this quarterly publication because it's all about cards created by people who LOVE to play with ink/ stamps/ paper and cardstock. So for the next several weeks, all of the designs will come from my back issues of Take Ten. This week I'm starting the series from the 2005 Volume 4 issue. Rather than be inspired by a layout, I had an idea in my head and went looking for one to coordinate. I spend a lot of my mornings in a local small-town cafe called Flossie's Apple Barrel. There are your regulars who come in. One gentleman just turned 95 years young last month. Ray Haynes is as sharp as a tack and has grown up around Winona MO all his life. So with Ray in mind and a pre-stamped image from a swap in hand, I went through the Take Ten. 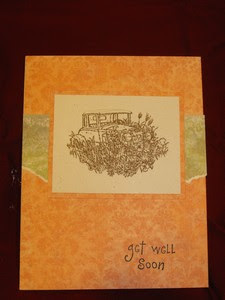 The closest I could find to an idea I had is from Linda Beeson - check out her blog at PaperCutting Kind of Day. It's a really cool blog! Linda's creation for this issue was called Giraffe Greeting. She used a image and sentiment from Stampin UP, coloring the giraffe with a yellow crayon (when's the last time we used those!) Her center panel is an animal print layered on a black cs strip. Her giraffe image was layered over a caramel stamped background which she'd mounted on black and it was off-set to the right of the card. She stamped the sentiment on a smaller matted square and overlapped the image a bit. Everything was neat, clean and crisp. Very pretty card. Well, you know I like texture and before finding this, I'd already torn my paper strip. LOL All my papers were from the DCWV Old World slab and the image is from a retired SU set. I decided not to color the truck. I thought it looked fine just the way it is. I think I am going to add a little color to the flowers. I was so concerned with getting this uploaded before I had to shut down due to storms, I didn't even think about it. LOL So picture those flowers with a bit of color. Tomorrow I'll show you pics of the CD albums. They are finished and ready to go postal! Today is the final day I'll have the teenaged friend and my husband home. Tomorrow he will drop her back off at her home in central IL on his way back to work in Chicago. Then my time will be my own to do whatever for the next three weeks. Today, I'm taking Kassie to our local library where she can shop for used paper backs to take back home. Hard to believe my once 5 week old daycare child is now old enough to read the softer Harlequins :-D They grow up way to fast. But I am very proud of the young lady she has become. This evening while Bob is off fishing, Kassie and I will be creating a CD album. This album is a project featured in Outstanding Mini Albums by Jessica Acs. I love her projects. They are so basic to do with beautiful results. I'm creating 5 of them for a swap with the theme... 8 Gifts That Don't Cost A Cent. But first we're off to soak up the humid weather in search of a Pepsi Can. I'll explain it later... with pics. Oh and while you're out and about... pick up the latest issue of Cloth Paper Scissors Studios. There are some great storage ideas you won't want to miss. I'm always inspired by these gals and it's how I met Roberta from The Love Shack! Yep. Remember that 103 degrees I was battling last week. This week I get storms - and I'm to have 15 people here for a backyard cookout this afternoon. The sky doesn't look any more promising today than it did yesterday. Anyway... here's the card I had ready to post before the thunder rolled. Last Tuesday I took my weekly stroll through the neighborhood quilt shop and found some fabrics I knew would go great with a 'new' set of stamps I'd recently purchased from a friend on SCS. About ten years ago (man, has it really been that long since my first swap?!) I was introduced to FRAZZLES. What are 'frazzles'? Well, unlike my nerves at times, they are strips of cotton fabric, frayed on at least 2 sides, usually all four. You cut your fabric to size then begin stripping the threads away one by one until you have the desired width of 'fray' aka FRAZZLED. This week's inspiration came from designer Rhonda Palmer. Her 'Pastel Daisies Thank You' in the Spring 2006 issue of Paper Creations Magazine gave me the idea to use the frazzles. Rhonda chose Green Daisy, Blue Daisy and Petal Pink Daisy DP from Scissor Sisters. Her image is matted on Yellow Daisy. She accented with a 3/8" black check grosgrain ribbon and a 3/8" green button. I used a 5x6.5 So Saffron base. My sunflower fabric was cut to a 2" width then frayed on all four sides to about 1/8" width. My image is from Simple Flowers (SU) and matted on Certainly Celery. 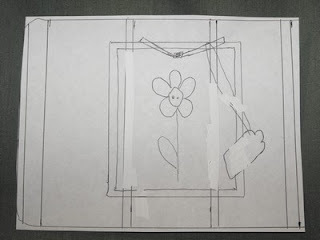 I inked only the flower and stems on the mat. The sunflower centers are inked with Black Glaze for a bit of dimension. Then I cut the vase from a pale blue vellum and layered it over to give the water-filled vase effect. Thinking Of You is from Three Little Words (SU) and I accented with 3 green brads. With all the wonderful fabrics SU has come out with recently, here's one more way for you to combine the fabrics and their coordinating images. Don't let it FRAZZLE you! Happy Monday Everyone – Oh wait… it’s Tuesday (and evening at that). Monday was just nuts! I’m still trying to get the garden situated and the heat lately has been crazy hot. We were 103 yesterday… didn’t drop below 100 before 9 p.m. Tired of this already. Add to this I have a visiting teenager. I’ve not seen Kassie in two years so we have lots of catching up to do. Luckily she likes to craft with me – still at 14! I’m so proud of her. She got in late Thursday night and we’ve been on the constant go doing stuff since she got her. Which means Monday was my catch-up day for business. All I managed to accomplish toward today’s post was to cull the magazines for the card I wanted to do. My inspiration for the card this week came from a swap I’m in. Our challenge is to create a card showing our favorite things. I love flowers. Not necessarily daisies, though they are very pretty. My favorite is actually roses or lavender. But I loved the stamp set I bought and thought it would fit perfectly. 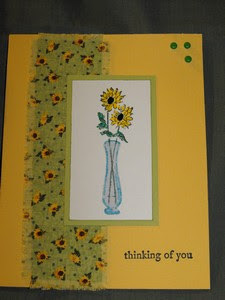 flower stamped using Twinkling H2Os in white and yellow against a harlequin patterned paper (the pattern is shadowed on a black background then the white daisy stamped in the middle). She matted the image on Certainly Celery CS then on black CS. Where I used the Pear Pizazz Ribbon Seam Binding (SU spring mini 2011), she used a sheer green swiss dot. I replaced her black accent knot on the beaded safety pin with a snag of white to offset the white mat. I chose So Saffron as my base, stamping the harlequin image from SU Background Sampler in Certainly Celery. 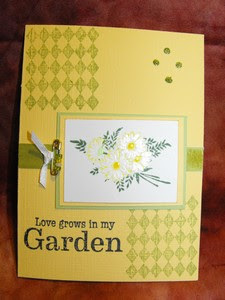 The image is from Studio112, a $1 stamp line distributed by K & Co. It’s called Love Grows in my Garden. Rather than brads, I let Kassie add the light green Stickles in a diamond pattern – her idea – to mimic the diamond pattern in the harlequin design. Told you she was crafty! I’m really happy the way this card turned out and I hope the recipients in the swap are too. What do you think?